Brûléed. All those accents are making me dizzy, but isn’t that just one of the prettiest words ever?! Especially if you say it in a proper French accent, and even more especially when you think about what it actually means: crispy, almost-burned sugar, like you’d find on the top of a crème brûlée, that makes a pleasant crack as you tap it with a spoon. It’s one of the most satisfying food experiences there is (about on a par with seeing strings of cheese as you pull away a slice of pizza…). So why not put a brûlée topping on a cheesecake? A ginger and rhubarb cheesecake, to be precise. I’m generally not the hugest fan of ginger, but it turns out ginger, rhubarb and cinnamon are the best combination in the world – I’m a total convert. I don’t think I’ve actually made a baked cheesecake before. I’ve made no-bake cheesecakes a few times, but I’ve always avoided the baked version in the past, purely because me + baking generally doesn’t end well. But, although this baked cheesecake definitely took a little longer to make than the non-baked version, it was pretty easy! If I can do it, anyone can (and the brûlée topping hides any number of sins…). As you’ll see, it’s not tricky! There are three main elements of the cheesecake, but they’re all very straightforward: the base (made from gingernut biscuits, which make a great change from the usual digestives), the stewed cinnamon rhubarb, and the creamy cheesecake mixture. Layer them all up, and you’re nearly there. Line the base of your cake tin with Bacofoil non-stick paper to make sure the cheesecake doesn’t stick to the tin – it helps to make sure your cheesecake slices are perfectly intact (why go to all the effort of making a baked cheesecake if you’re going to let it all crumble away at the last hurdle?!). Once it’s all layered up, the cheesecake is cooked in a bain marie to make sure it cooks evenly all the way through. I know, more French, but it’s not as intimidating as it sounds – it’s just a water bath. Just use Bacofoil kitchen foil to create a watertight bowl around your cake tin, and pop it into a dish of water before cooking. That’s all there is to it. I used a 20cm cake tin, rather than a 24cm cake tin like Dean did, because I like a nice deep cheesecake. As a result, it took quite a long time to bake – nearer 2 hours than the suggested 1 hour – but it still turned out beautifully! So just use whatever cake tin you have handy (within reason!) and adjust the cooking time accordingly. It can still be a little bit jiggly when you take it out of the oven, as long as it’s not completely liquid. The brûlée topping couldn’t be simpler – it’s literally just sugar. If you have a fancy blowtorch (a little chef’s one, not an enormous one that could burn down your entire house) you can use that to caramelise the sugar. Or, if you don’t have one, you can just pop the cheesecake under the grill for a minute or two instead. Beware – once the cheesecake has been stored in the fridge for a while, the brûlée loses its crunch, so do this just before serving if you’re looking to impress. And after that epically long post, I feel I need to go and have a sit down with a slice of brûléed ginger and rhubarb cheesecake. Thank you and goodnight! Line the bottom of a loose-bottomed springform cake tin with non-stick paper. I used a 20cm cake tin, but use a 24cm tin for a thinner, larger cheesecake. Combine the crumbed gingernut biscuits with the melted butter, and mix thoroughly. Press the mixture into the base of the cake tin, and place in the fridge. Melt the butter in a saucepan over a medium-low heat, and add the chopped rhubarb, caster sugar, cinnamon, and Amaretto (if using). Cook for around 5-8 minutes, stirring occasionally, until the rhubarb is soft but still holding its shape. Drain away any excess liquid, but keep it to drizzle over the cheesecake when serving. Set aside the rhubarb to cool. In a large bowl, combine the caster sugar, vanilla extract, cream cheese, eggs and sour cream, and whisk together until smooth. Heat the oven to 160°C (Gas Mark 2-3 / 315°F). When the rhubarb has cooled a little, remove the cheesecake base from the fridge, and add the rhubarb. Spread it around into an even layer. Use a large piece of kitchen foil to create a watertight seal around the cake tin, and place it in a baking dish. Pour an inch or two of water into the dish, making sure that it doesn't get inside the foil seal. Pour the cheesecake mixture into the cake tin on top of the rhubarb. Bake the cheesecake in the bain marie for 1-2 hours, depending on the size of your cake tin (a smaller cake tin will produce a thicker cheesecake, and will take longer to bake). My cheesecake, in a 20cm cake tin, took around 2 hours to bake. When cooked, it can still be slightly wobbly in the centre, but should be mostly set and no longer liquid. To brûlée the cheesecake, sprinkle over a little more sugar, and caramelise it using a chef's blowtorch, or under a moderate grill (broiler). This is best done just before serving. Serve drizzled with the rhubarb syrup that you drained from the rhubarb earlier. Love new takes on classic desserts? 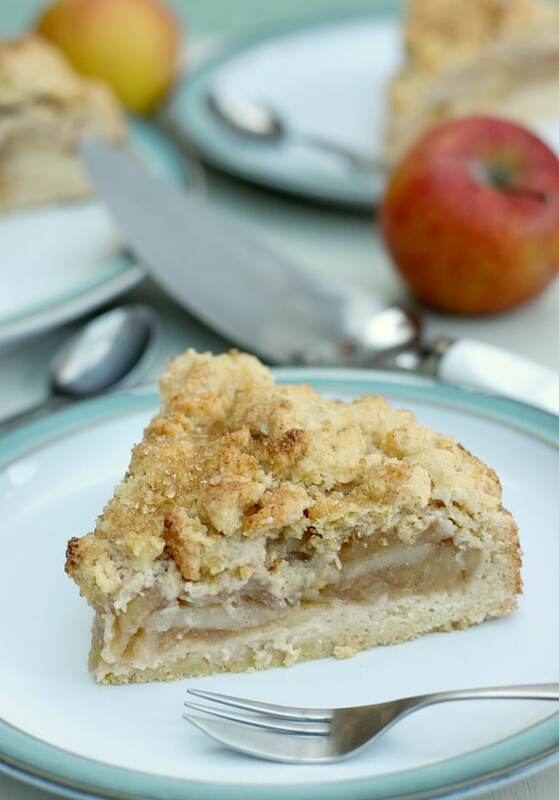 How about my apple crumble cake – it’s so much easier than it looks! This sounds absolutely gorgeous! I’m going to try making a GF version to see how it turns out! Ohhh I love rhubarb I’ll do it today. This is not my first time on site, previously I have seen many good recipe here and they were all good after we made them at home. ginger, rhubarb and cinnamon are together looks good combo as you also mentioned. crunchy topping, with favourite cheesecake, Awesome. Oh YUM!!! I love rhubarb and I love cheesecake and this looks absolutely heavenly!! Welcome to the site ;) I’m sure this would be easy to make gluten-free, can you get nice gluten-free biscuits to use in the base? I’d have to use another fruit, as I don’t eat rhubarb! First cheesecake I made was a baked one – I think they were the only ones people knew about, back in the early 1970s. Yours would be lovely if I used plums instead of rhubarb (eyes the plums in the fruit bowl, thinking…..). Plums would definitely be great in this too! Wow, that looks phenomenal, I know my Pete would adore it, he loves rhubarb, he loves cheese cake and he loves creme brulee! Wow this cheesecake looks awesome and I’m the same as you having never made a baked cheesecake! Must fix this state of affairs now! This looks absolutely gorgeous – I love rhubarb but have never had it in a cheesecake before. With the crunchy topping too this has to be a winner! This looks incredible Becca. I love cheesecake, but I have never made my own, as I am afraid that I would eat the whole thing haha.